2011 Model. 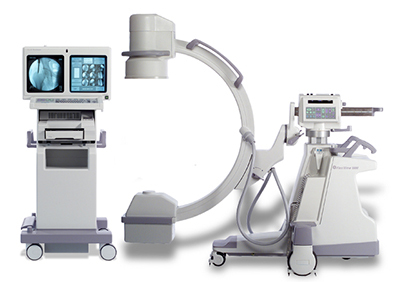 Dual Flat-Panel LCD Monitors, 9-Inch Image Intensifier, Vascular and Orthopedic Imaging, 2000 Image Storage, Foot Switch, Hand Switch, DICOM, Operator's Manuals. 1Kx1K High-Resolution Imaging Technology, 8 Frames Per-Second Capture, Maneuverable, small footprint, User friendly touch screen, Autotrak for true "point & shoot simplicity", PreView Collimation (Onscreen collimator indicators). In-Stock Now!